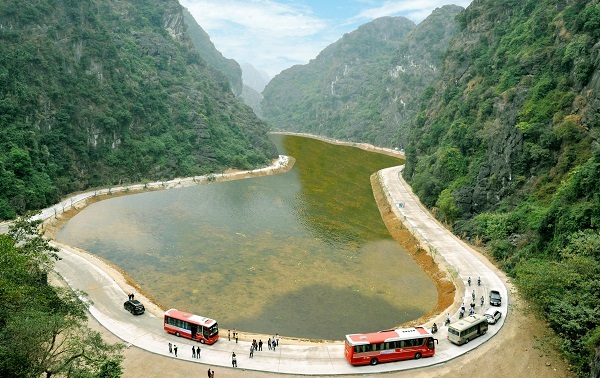 Ninh Binh, a famous place with many beauty spots, is known as an ideal destination for tourists all over the world. Have you ever heard that Ninh Binh is one of the most attractive destination in the Northern Vietnam with extremely imposing and magnificent landscapes? It is high time to join in the trip to Ninh Binh to explore the famed place-names. Famous landscapes in Ninh Binh in particular and in Vietnam in general are considered “super scene” of nature, with the later-period cinematography of Hollywood, they become much more sparkling, eye-catching and exceedingly attractive. Recently, after the movie Kong: Skull Island has been public, natural scenes of Vietnam was constantly given compliment from both domestic and international presses. Three destinations of Ninh Binh including Trang An, Van Long lagoon and Tam Coc – Bich Dong were selected as scenario for the movie. Trang An appears in the mysterious and neglected beauty with the system of entangled limestone mountains. Meanwhile Tam Coc is characterized with the harmonious combination of stones and water. Additionally, Van Long lagoon provides visitors with charming beauty, its surface and water are so pristine that visitors can clearly see all water-plants and mosses in the bottom. 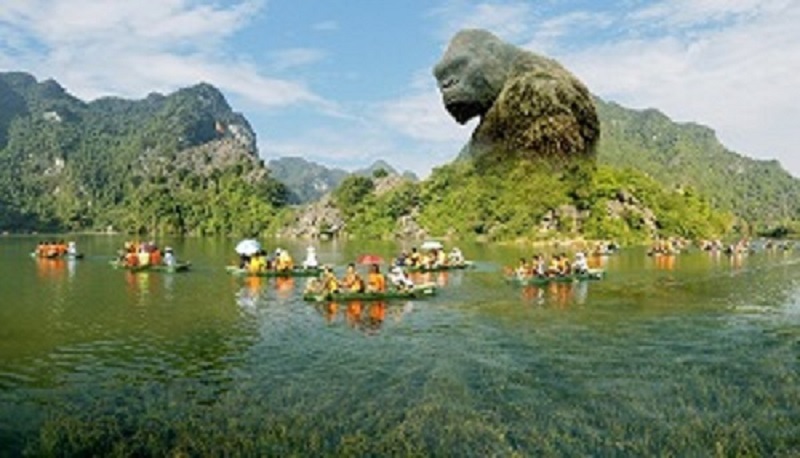 Moreover, Ninh Binh was also appeared in movie scene of The Quiet American and the blockbuster named Pan. These scenes were presented for a quite long time in a true to life way and it was enough for anyone who have ever known or visited Ninh Binh realize it. Am Tien cave is located in the center of Hoa Lu old capital, about 10 km from the city center. Legend has it that this is the place where Dinh Tien Hoang King contributed execution ground to chastise guilty people and it is also the place where Duong Van Nga Queen Mother led a religious life at the final days of her life. The majority area of Am Tien cave is the flooded valley, covered with cliffs, which makes it as beautiful as in Elysium. Therefore, many visitors compared this to the famous breakoff valley in The Return of the Condor Heroes movie. Mua cave (Dancing cave) is situated in Trang An ecotourism area, in the Khe Dau Ha hamlet, Ninh Xuan commune, Hoa Lu district, Ninh Binh. Dancing cave is an extremely suitable place for nature lovers or those who are keen on nature exploitation. The name “Dancing cave” is derived from a folk story. It is said that long time ago, the King of Tran dynasty left the capital to Hoa Lu and established Thai Vi temple. He often visited this cave to watch imperial concubines and beautiful women sing and dance. That was the reason why people called it “Dancing cave”. The way to the top of Dancing mountain is inspired by the Great Wall of China. To conquer this mountain, visitors will experience with 486 rungs of ladder. 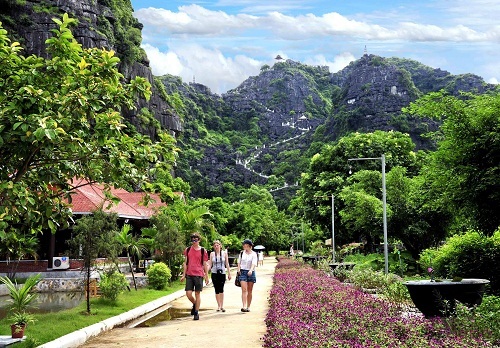 From the top of this mountain, visitors can enjoy the entire view of Tam Coc.